In this article we are going to bring together the first 4 tips from reverb maestro Michael Carnes from Exponential Audio that we have been sharing on the Pro Tools Expert Podcast recently. 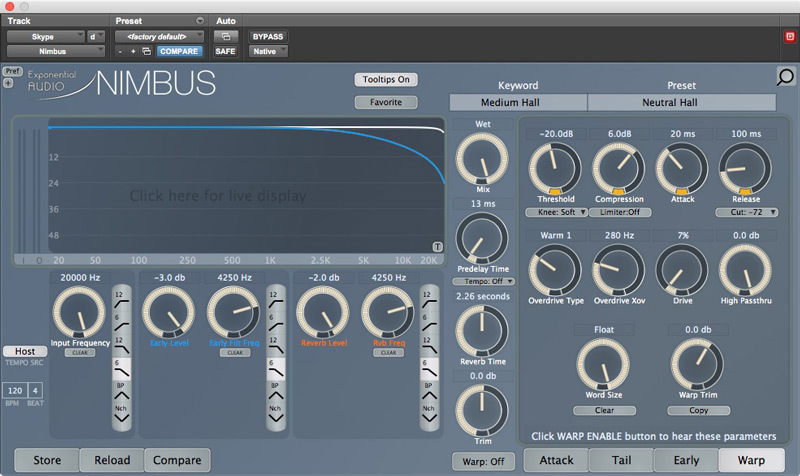 The first 4 are Using the Compressor To Make Level-Sensitive Reverb With The 2nd Generation Exponential Audio Reverb Plug-ins, Making Great Sounding Small Rooms, Using The Chorus Effect In Reverbs Creatively In The R2 Series and How To Use The Tail Suppression Feature In The 2nd Generation Exponential Audio Reverb Plug-ins. There's a compressor/expander built into the warp page of all second-generation reverbs, that’s NIMBUS, R4, Stratus and Symphony. Like any compressor, it can be used for good or evil, but let's talk about how to do something subtle and powerful. Start with a music track with a large dynamic range and find a neutral reverb preset that suits the music. Select the Warp page and click the Warp button to 'On'. You'll now see the warp parameters. At bottom left of the page, click the 'Clear' button to set values to neutral. Now look at the top row of controls. That's the compressor. We're going to use it to raise the amount of reverb on quieter passages. Try setting the threshold at -20dB for now. Set the knee to Soft. Now raise compression to 6 dB or so. Set the attack to about 20ms and the release to 100. These are just baseline settings and you'll should feel free to vary them as needed. The point here isn't to capture sharp transients: it's to modulate the reverb send based on level--much as you might do by hand. You might find that you want to duck the Warp Trim parameter if you get too much gain. What if you'd like a lower reverb level for quiet passages, so that the detail is more clear? Just turn the compression dial to the left (until you see negative numbers). It's now a downward expander that cuts the reverb send as input diminishes. This is just a quick peek at what a compander inside a reverb can to. There is a clever little trick on making small rooms using Exponential Audio reverbs. Michael has produced a great tutorial using Phoenixverb but what Michael shows will work with all the Exponential Audio reverb plug-ins. What is surprising is that it isn’t all about early reflections The reverb engine itself provides a complementary set of reflections but the trick is to turn reverb time to minimum. But there is a lot more in Michael’s comprehensive tutorial, so do check it out. The Chorus effect in reverbs was originally designed as a way to reduce unpleasant resonances and room modes in those early reverbs. Chorus worked by introducing LFO-controlled pitch shifts into the reverb tail. It wasn't much loved among reverb designers, but was a necessary compromise because of the limited power of those first reverbs. Mixers however didn't care; they liked the effect of the modulation and this became a staple of mixes in the 80s and 90s. Chorus really isn't necessary any longer, but mixers still like the effect. The R2 family of reverbs provides this effect, but with an Exponential Audio twist. Obvious modulation, with pitch modulation ranging from subtle to nausea-inducing is still available. But a visit to the Chorus page will show a pair of options with the intriguing 'Fat' label. The Fat mode drives the chorus so that pitch goes up and down at the same time. The result is unexpected, in that the pitch effect is very hard to detect. Instead, the reverb just gets fatter. Sometimes tracks may be well-recorded and well-performed, but still somehow sterile. Fattening the reverb can add extra richness and warmth. At the bottom center of the Tail page is a little "Key" button. Make sure to select either "Input" or "Both". Now dial in just a little suppression, let's say 2dB. You should see the meter at right showing some action. Set the "Tail Recovery" at minimum (or at least a very low value). That's all you need to do. The reverb will be natural, but those peaks will be slightly constrained. It's fun to play with exaggerated effects as well. Dial up the reverb time, set "Tail Suppression" to maximum and increase the "Tail Recovery" time. You'll then get a strong "whump" from the reverb that comes in after the transient. This is particularly noticeable with kick drum. But where this circuit shines is its ability to lower clutter in a mix.